Germs and disorganization can run wild if the kitchen sink and under sink have no system of order. It's easy to keep a wet sponge or scrubber at the bottom of the sink when you don't have a place for them to be stored. It's also easy to use your under-sink storage to cram and shove all the cleaning odds and ends for not just your kitchen, but all around your house, too. Banish both of these issues with a few of our storage tips for both of these problem areas, below! Think In-Sink Sponges and scrubbers can breed germs if not properly wrung out and kept in a dry place. Ensure that they work use after use by adding an in-sink sponge caddy that allows them to air-dry instead of soak up residual sink water. 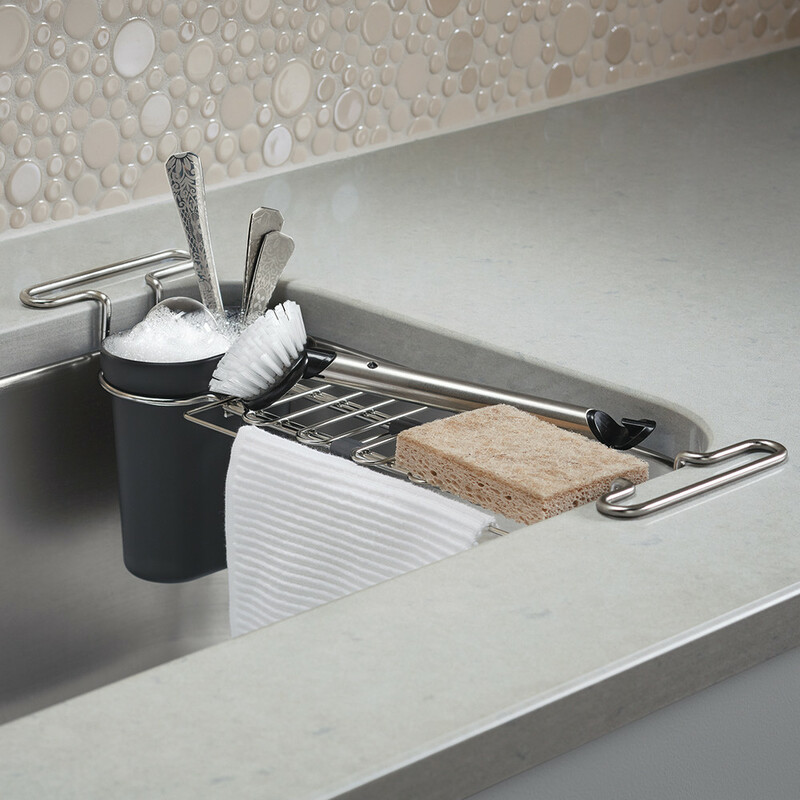 In-sink sponge caddy's attach via suction cups or hook over the middle of the basins, but you can also choose a freestanding storage option that is raised above the sink level. Make sure that whatever solution you choose, it comes with ventilated holes to drain out excess water and allow air to flow and dry the sponges, scrubbers and small utensils. Our expandable Kohler Chrome Kitchen Sink Utility Rack is so convenient, you'll wonder how you ever did without it. Use it as a drying rack for cups and dishes, and to hold a sponge. A removable soaker well is the ideal spot for soaking dirty utensils, and there's even a place on the side to hold a dish cloth. A non-slip coating keeps the rack in place. Storage In Unexpected Areas An often-overlooked space for under-sink storage is the back of your cabinet. 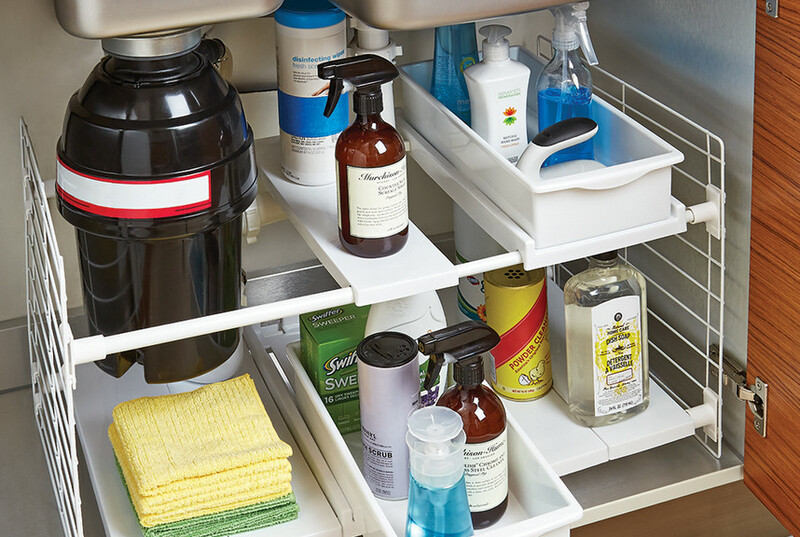 With over-the-door options of hooks and hook racks, you can store all of your go-to cleaning necessities where they are easiest to access. Maximize space on the back of your under-sink cabinet door with over the cabinet hooks and hook racks. They'll keep towels and cleaning tools tidy and easy to reach for. 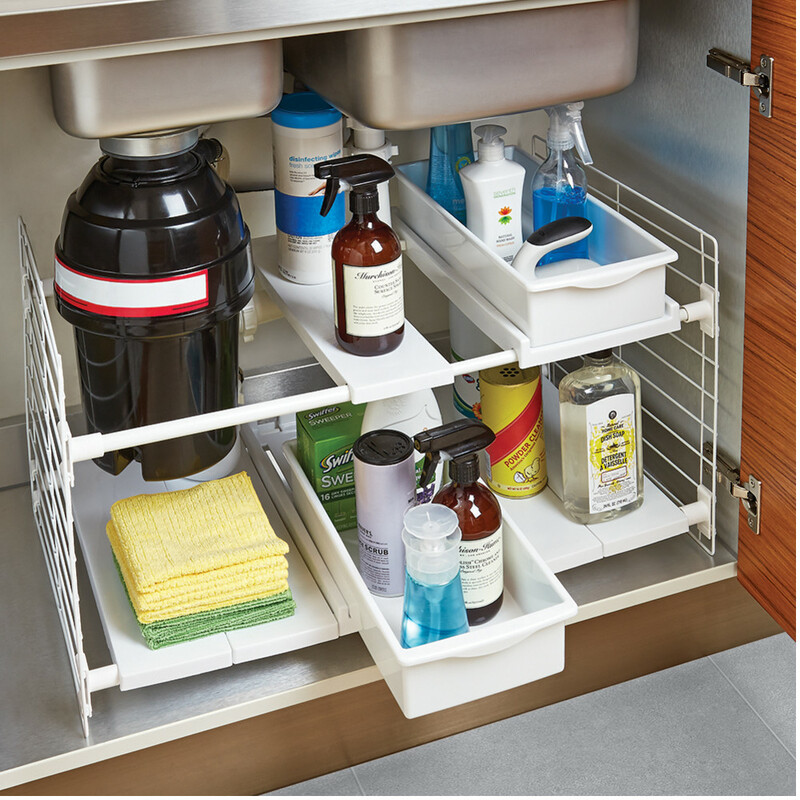 Our straightforward Cleanser Rack keeps bottles of cleaners at the ready in the kitchen, bathroom or laundry room. It's easily installed inside a cabinet door or on the back of a door and creates such valuable space where before there was none. 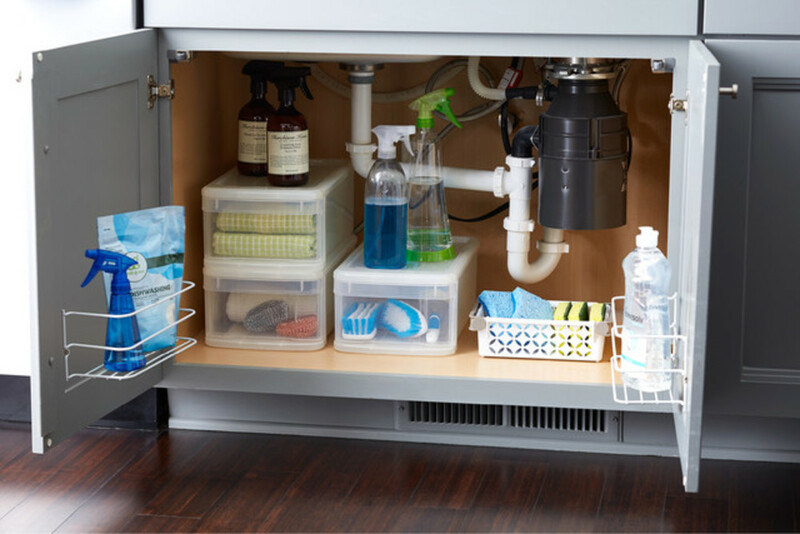 Customize Your Storage Create a custom under-sink solution with a tiered, modular or expandable drawer solution. They eliminate the dark and underutilized space in the back of your under-sink cabinet and give you options to organize around a disposal. For frequently used items that you need all around the house, choose a removable caddy with handles so you can tote everything at once and put it right back where you found it. Have a few under sink solutions of your own? Let us know in the comments!